Say hello to my new favorite outfit. I've been trying not too buy too much this summer, but I am allowing myself to put all of the money I make from selling clothes toward new ones. I told myself that I just want to stock my closet with more classic, well-made pieces, even if it means saving my money and putting it toward just a few more expensive items. As one would expect, that didn't last long because the moment I saw this dress on the clearance rack at H&M, I knew I had to have it. I bought it a couple of weeks ago actually, but I've been waiting to wear it. You see, after I won that $50 gift card to Modcloth from Illana, I spent hours looking at the website trying to decide what to spend it on. I had a ton of stuff in my cart, but I kept coming back to these boots. I've been wanting the perfect pair of booties to wear with everything for forever, and I finally decided that these were the ones. So when I bought this dress the day after ordering them, I knew I had to wait until the boots came in so I could wear them together. And judging by how happy I am in this outfit, I'd say it was worth the wait. I also want to introduce you to my new favorite spot for jewelry. I stumbled across Fifth & Mae a little while ago and was immediately in love with not only their great selection of unique every day jewelry, but the ridiculously affordable prices. When I realized that they offered a discount to some bloggers, I'm jumped at the chance. 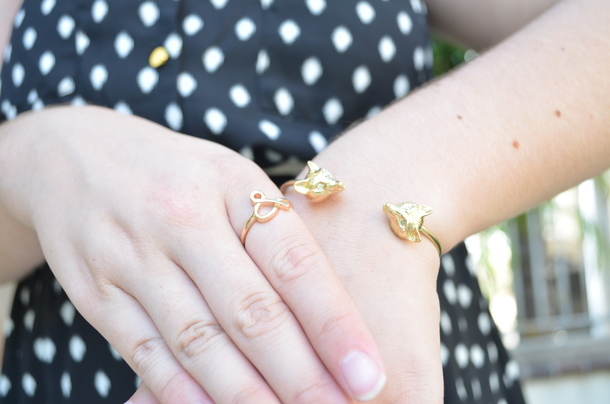 Ampersands and foxes are two of my favorite things, so buying these pieces was a no brainer. I got a couple more pieces that I can't wait to show you, but for now I will say that I'm extremely impressed with Fifth & Mae. Shipping was incredibly fast, the packaging was darling, and the quality is fantastic. Usually cheap jewelry looks and feels that way, but I would have never guessed how little I paid for these pieces just by looking at them. I might just be getting all of my jewelry from there from now on. And no, this isn't a sponsored post. While I was offered a discount, I still paid for the pieces and was not asked to write any of this. I genuinely just really love this store. In non-clothes-related news, my brother and his girlfriend came into town last night for the week so I'm taking today off from my internship! They live in Arizona and I only get to see them a couple times a year. If you couldn't tell, I'm pumped. The bracelet is so so adorable. :))) I have a weak spot for foxes, especially. These pictures are sooo pretty, and lol at you cracking and buying clothes ;)my new apartment has the TINIEST closets and i have a lot of clothes, so im at the point where i cant even think of buying more stuff to cram into corners. it's very upsetting. and i LOVE the boots you decided on. oh they'll just go with everything! Oooh, you definitely found the PERFECT pair of boots - these are awesome! cute! i love the little foxy fox! This dress is so flattering on you. The shape and cut really do wonders for your figure. And polka dots and blue? It might be made for you. Also those boots are totally 100% my style and I'm kind of in love and blue and brown? I kind of dig it. I honestly never would've thought to pair the two. What's wrong with me? Lastly, your pictures are always the happiest I see on blogs and I thank you for that. Thank you so much for your incredibly sweet comment! 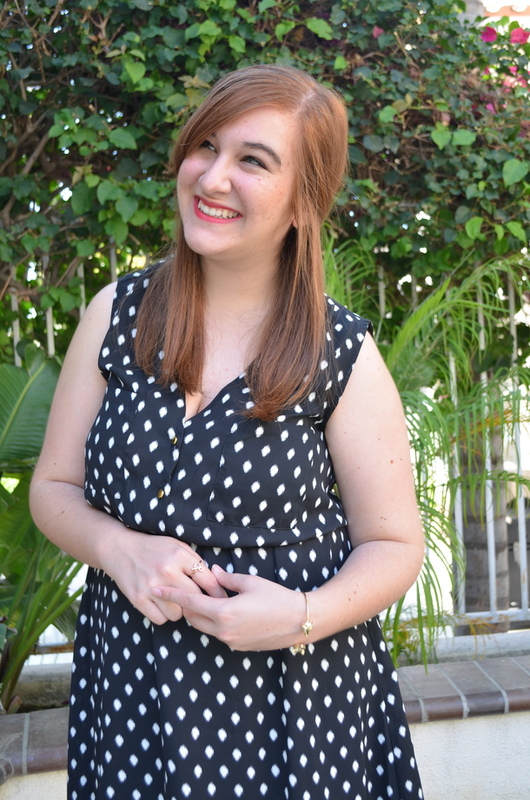 I love your blog and you already <3 I'm definitely keeping up with your blog. By the way this outfit is great and I think those boots were the perfect choice to spend that gift card on! Ah I almost bought something just like this in Buffalo Exchange but it fit more like a top and I wanted it to fit more like a dress. And the fox bracelet is super cute. Cute blog. Following via Bloglovin. Such a cute dress and amazing boots, you look stunning! I love your dress- the lenght, the print, the cut- I could use one in my closet! Also, I love the adorable details like your bracelet, such a great look! 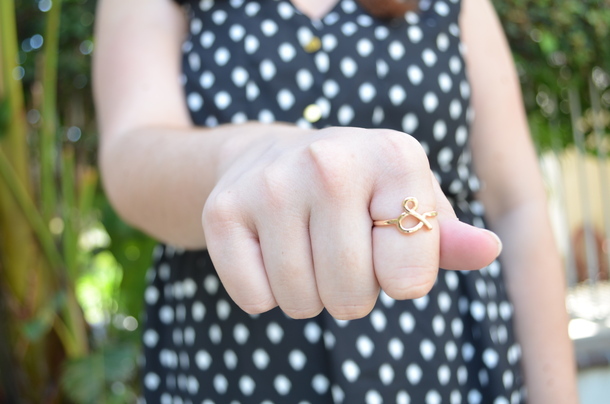 oh mah goodness, I think I might need to snag one o' them ampersand rings, heehee. so cute! I dig the whole outfit, and the boots! I wish I could pull off boots!! Ohhhhhhh!!! 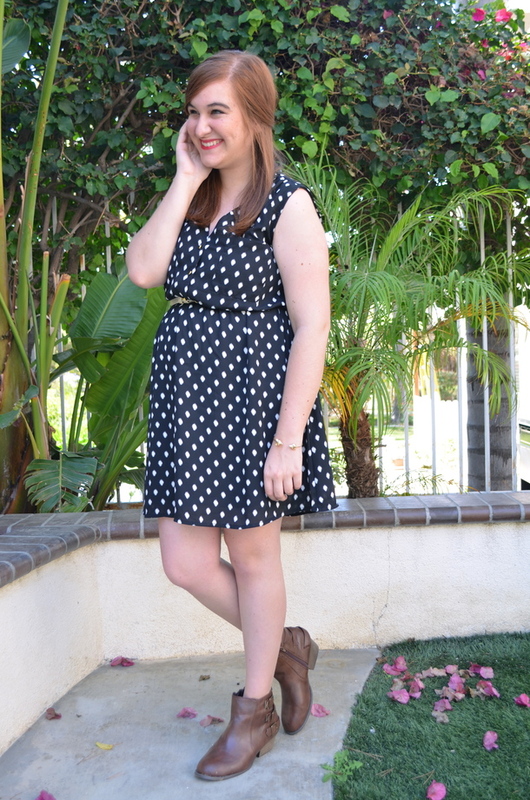 !love this polka dot dress!!! H&M clearance rack is where it's at! I always find such amazing deals there. This dress was definitely a great purchase! You'll be able to remix it for all seasons. Your lip color + this dress = perfection! I now own two pairs of booties, and find myself wearing them alllll the time! A fantastic investment. Hope you had fun with your brother! Even though this is from H&M on the sale rack, I would still say you hit your goal of something more lasting and timeless. This is entire look is very mature- not that you don't always look mature but that this is particularly so. It is still fashion forward but aiming for elegance and getting it.